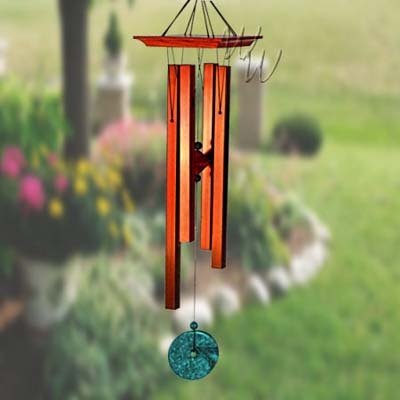 This larger version of our best selling Turquoise Chime is sure to be a hit. We have provided a sound file if you would like to hear this Chimes beautiful sound. Turquoise has been used throughout the ages to ward off evil and ensure faithful and reliable relationships. We're sure its beauty and restful tones will charm you, as well. Made of: Cherry finish ash wood, 4 square bronze anodized aluminum tubes, double pyramid clapper, faux turquoise. 26 Inch Turquoise Chime Medium.